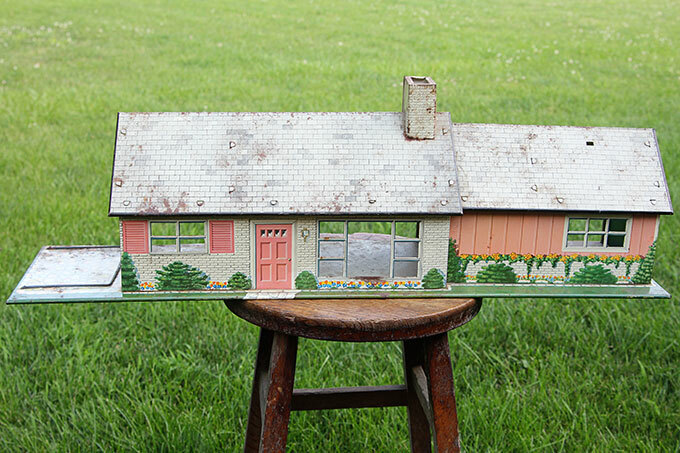 This is either a post about a vintage tin dollhouse, 1960’s Marx variety. Or a super cool birdhouse. Or both. 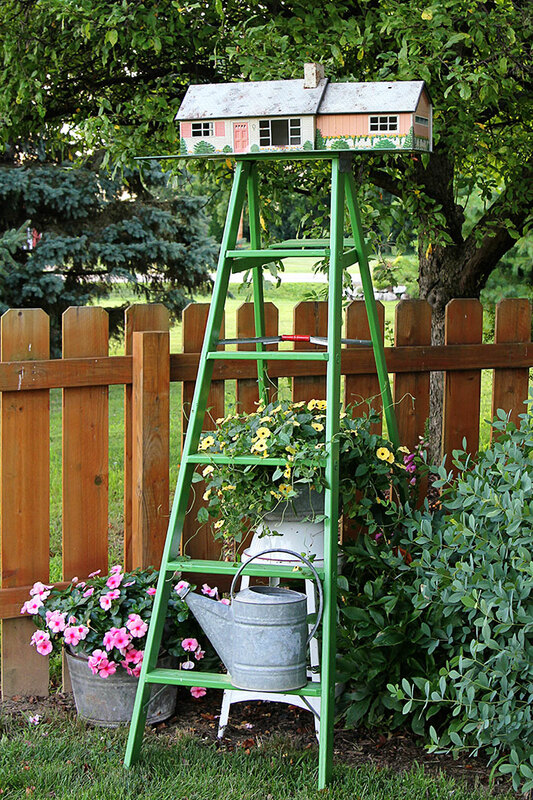 That green ladder is the one I showed you back in March in my Wooden Ladders As Garden Art post. The big debate back then was whether to leave it naked and natural or make it painted and perky. Painted or not, I had an idea in my head of what I wanted to do with that ladder. 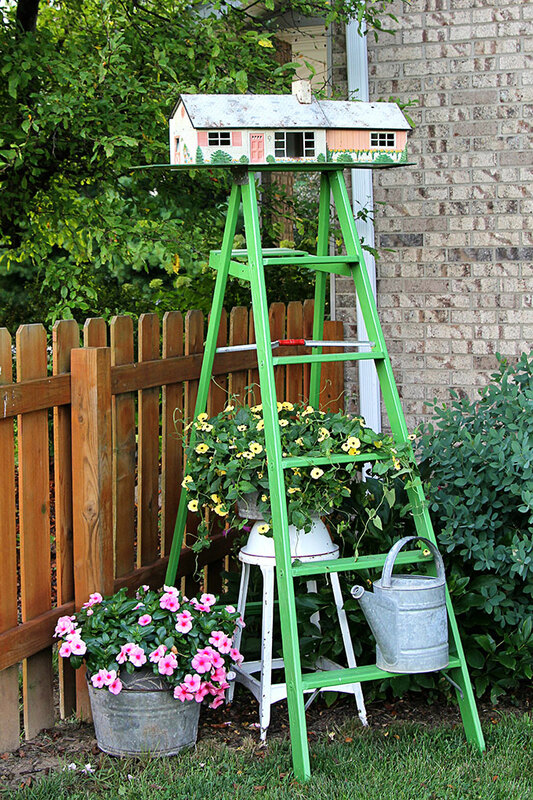 I wanted to repurpose a vintage tin dollhouse into a birdhouse for my garden and put it smack dab on top of the ladder. I didn’t want to use a dollhouse that could be still used by a little girl. 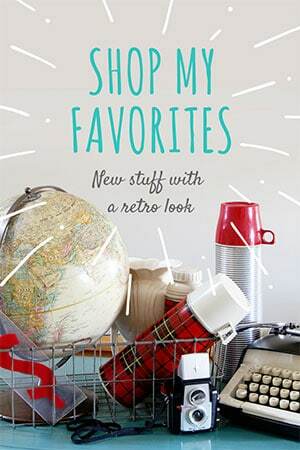 Or a big girl for that matter, because I know a lot of vintage collectors love using these in their home decor. It had to be CUTE, but in bad enough shape that I didn’t feel guilty about using it for our feathered friends. So I patiently waited until I found the right house . . .
And about four months into the wait, just as I was getting ready to give up, I was out shopping and ran across this pink-doored beauty. I was just walking along, looking at old tools and wooden crates in the man’s tool section of the basement of a local antique mall and happened to glance up to the very top shelf and I swear the Heavens opened and light shown down on her. She had no business being there. It didn’t make sense. She was neither a man’s tool nor belonged in the basement. The poor thing was destined to live out the rest of her life surrounded by old tools, greasy sprockets and oil cans. I very gently pulled her down from her perch and took a good look at her. She was dirty and grimy and rusty and oh, so pretty. Now like I said, she’s seen better days. It’s been quite a while since a little girl has arranged furniture in her living room. She has quite a bit of rust on her roof . 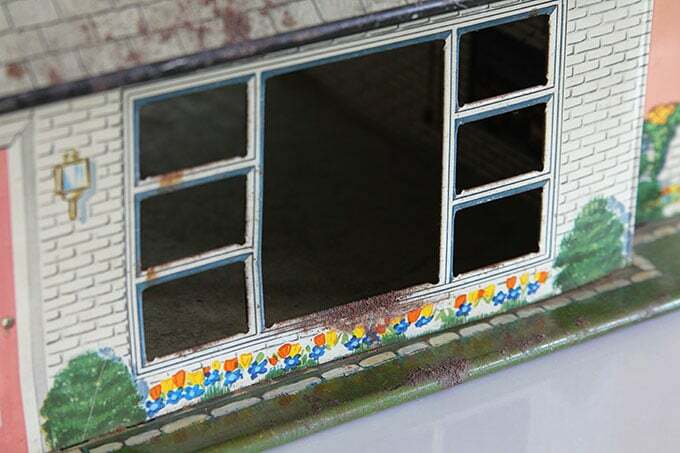 . .
she’s a bit discolored and parts of her are broken or missing (there’s an awning that should be hanging on this terrace). And this is her backside which isn’t looking as perky as it used to. Can I get a high-five for backsides not looking perky anymore! So she was a prime candidate for my project. 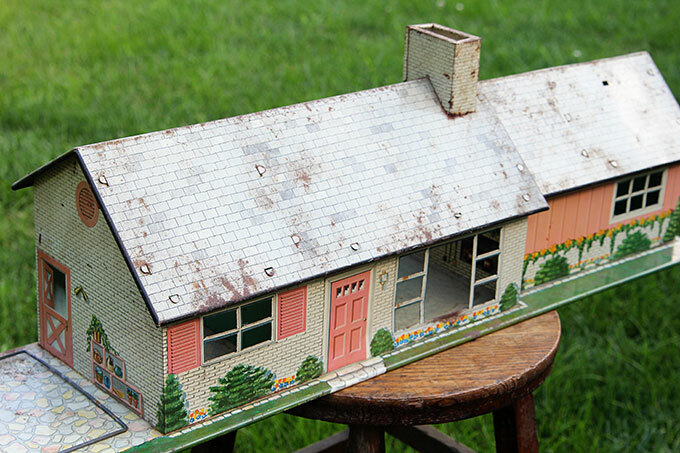 And really, what is more perfect than a ranch style dollhouse to go with my own ranch style home! 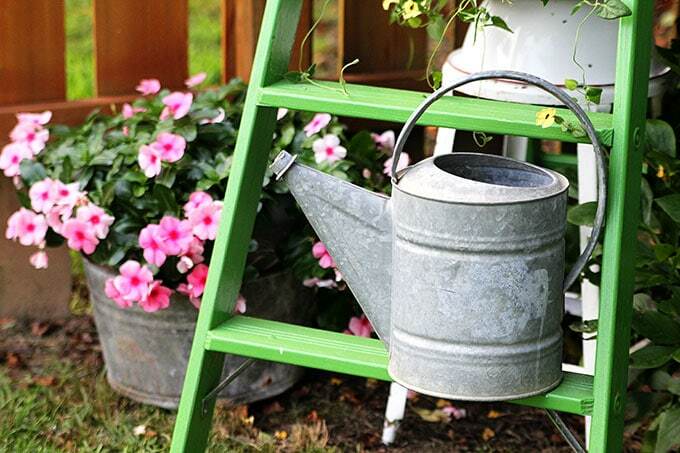 So right now she’s setting in my garden on top of a green ladder surrounded by pretty flowers. Breathing a sigh of relief from being freed from her dark, dank basement existence. BTW, the yellow flowers are black-eyed Susan vine. I normally plant this on a trellis, but thought I’d see how it goes growing it up the ladder this year. You can see my post all about growing these gorgeous vines at Black-eyed Susan Vines aka Heaven On Earth. Hey, I didn’t want this post to take all day to pull up on your phone or computer, so I put the tutorial on exactly how I made it on the second page (it’s more than just plopping the dollhouse out there and calling it a day). I had this dollhouse as a little girl in the 1950s-1960s. What a walk down memory lane! I had a two-story colonial for mine. Sadly, it got sent to auction when we cleaned out my mother’s house. I kick myself now for not having saved it! I hope you’re going to seal that vintage beauty from the elements so she won’t lose those gorgeous colors! What a lucky find though! I have one in the basement that I decided not to sell b/c the shipping would be astronomical. I remember having one too, & I played with it for years. I hope those birds enjoy it. How clever you are! Every time I’m in my favorite antique mall and see a vintage camera, I think of you. You’d probably have been in heaven. Some were $5. Sounds like my kind of antique shop! And yeah, normally if they’re $5 I’ll go ahead and buy them 🙂 I figure I’d spend that much at Wendy’s, so why not! Whew! When I saw the first picture you posted I was aghast!!!! 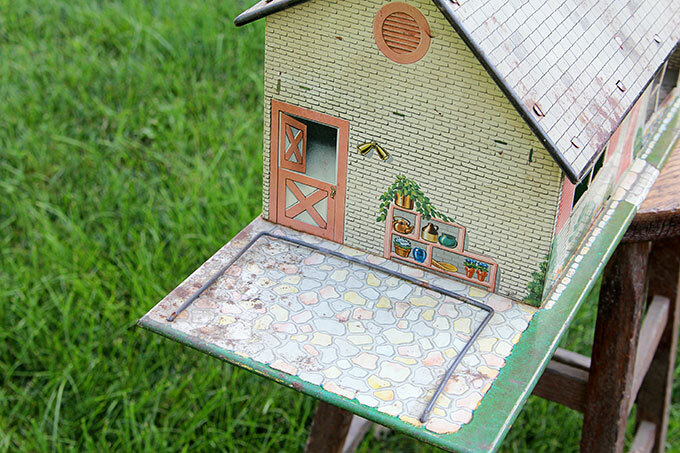 to think you had used the very doll house of my early years for a birdhouse!!!! But thankfully you have redeemed yourself by showing she was in the latter stages of her life, run down & pitiful & knowing she was destined to be all alone on that top shelf for forever I must say I do LOVE that you saved her & I LOVE this idea!!! Sooo cute! I have an old, but still nice dollhouse tucked away with intentions of using as a wall shelf one day. But I will now be on the lookout for one that is a little past perfection to tuck away in my garden for my birdie friends. Thanks for sharing such a great idea! Thanks for reminding me, I’m going to put a thermometer in there tomorrow to see if it’s getting hot in there or not 🙂 It sits between two trees so it’s shaded pretty much of the day, so I think it’s going to be ok. I don’t have the ladder staked into the ground yet, so I can still move it more under the trees if I need to (I don’t want to move it once tenants move it though). 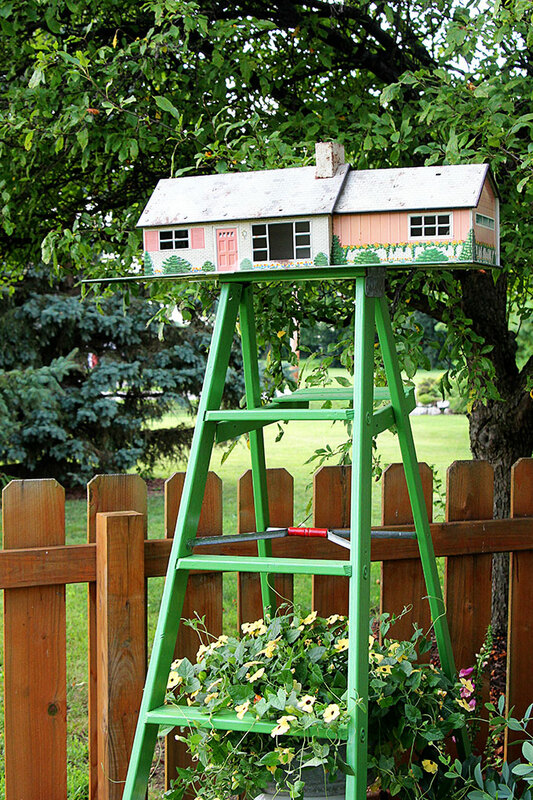 What a unique way to display the dollhouse and create a birdhouse! Love the colors and looks so pretty in the garden. I love the project! Curious about one thing. I see so many pretty examples of garden art and I’m eager to try some myself. 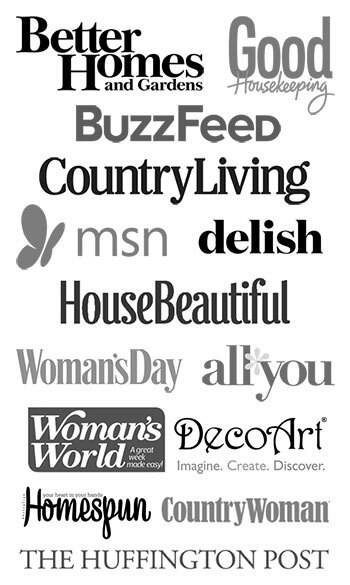 But….do you take all these things inside in the winter? The thought of moving a bunch of stuff inside takes a lot of the fun out of it. 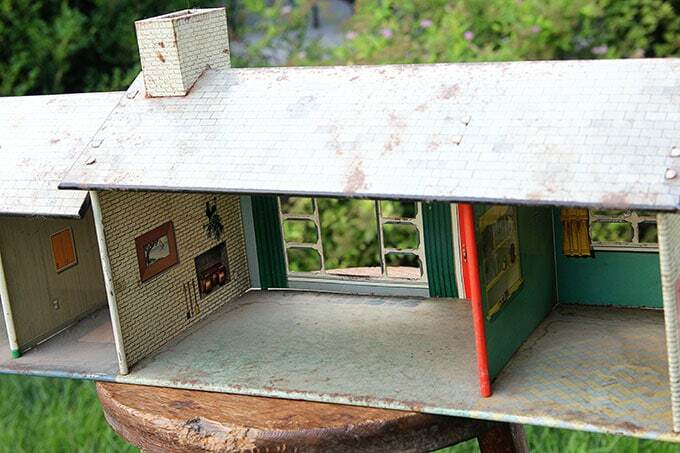 Was smiling while reading about the little doll house when suddenly I remembered I had a little doll house like this one back in the 1950-ties in Australia. Oh what a happy trip down memory lane you have given me, I had completely forgotten it. Super cute. I’m sure some house wrens will be quick to make a home in there! This is so cool! I have a few of the tin barns but they are still in pretty good shape so I’ll just have to keep my out out for rusty treasure like you found. And I wonder if Brian would notice if one of his thousands of ladders went missing and all of the sudden we have a pink ladder? This is so fun, Pam! Have you had any birds visit yet? A few have been poking around, but no one’s claimed it yet. I wonder if maybe it’s too late in the season this year? Love this! It’s so pretty and cute. 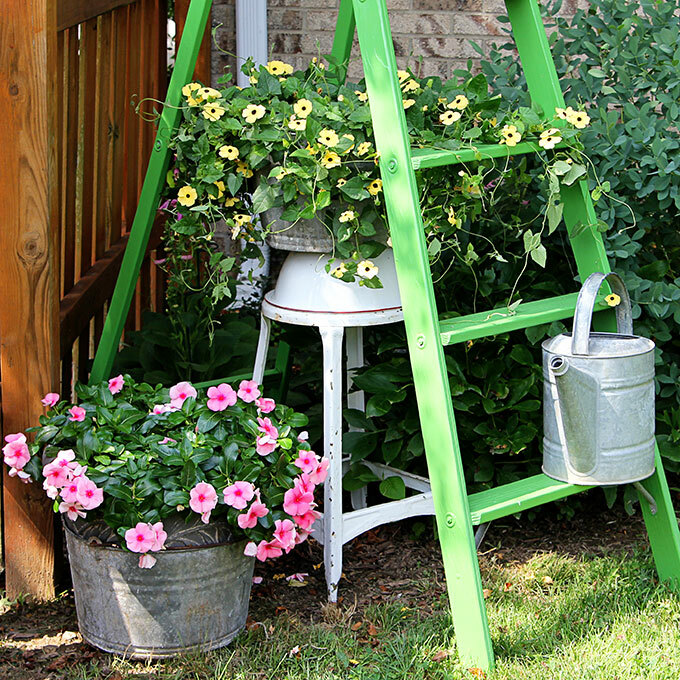 I’d love to find a ladder to use in my garden — I love the look and the pretty green you used! I love this! This is a darling idea! 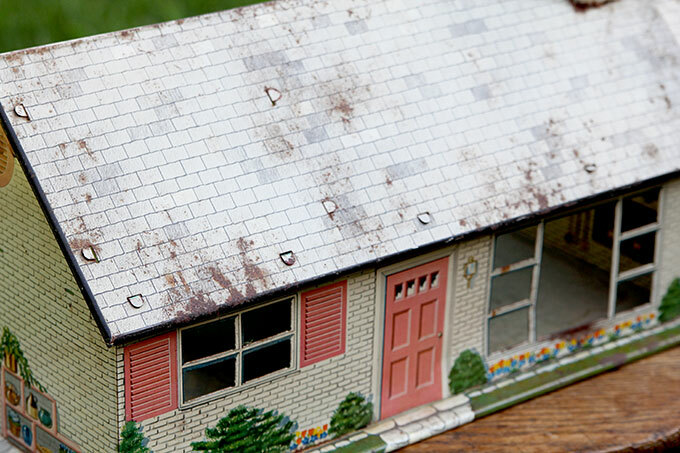 I have either the same or similar doll house from my childhood. I will have to find the box it is in and see if it is salvageable.. I think the paint is flaking off.